Amador County’s pet population was growing and the animal control facility was outdated and overcrowded. 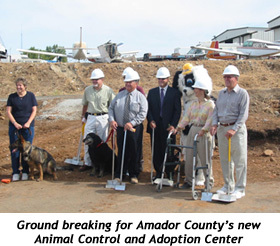 With the help of Amador Community Foundation, the animal control and adoption center fund-raising effort began, and a new, state-of-the-art, modern Animal Control and Adoption Center was built adjacent to the old facility. Partners came together with the common goal of eliminating the need to euthanize healthy adoptable pets in Amador County. The new shelter has also helped to attract and maintain a more professional animal supportive staff and group of volunteers. 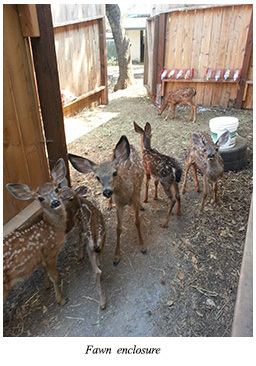 Tri County Wildlife Care is a local non-profit organization dedicated to the rescue, rehabilitation and release of local injured, ill and orphaned wildlife in Amador, Calaveras and San Joaquin Counties. As our population has increased, the need for wildlife care has also escalated. 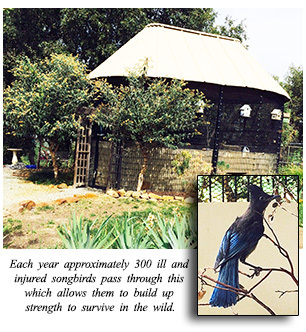 Each year approximately 300 Native Songbirds pass through this flight cage which was built with the assistance of the Amador Community Foundation. These birds arrive at Tri County Wildlife Care injured, ill and orphaned and their final step is this cage that allows them to build up strength to survive in the wild. “Amador Community Foundation was an essential partner in the shelter construction. They enabled animal loving donors to make contributions expressly for our animal shelter and gave this project the tax deductible status as well”. In 1988 the animal shelter took in 2400 animals with a population of 25,000 residents and over 85% of those 2400 animals were euthanized. In 2012 the population is over 38,000 residents and intake was down to 1824 with 74% of those animals being redeemed or adopted from the new animal shelter. The new shelter is a great success for the animals and for the community.